By 1919, after the war, radio pioneers across the country resumed transmissions. The early stations gained new call signs. Many early stations were started by newspapers worried radio might replace their newspapers. 8XK became KDKA in 1920. KDKA received the first federal license and began broadcasting on November 2, 1920. Its signal covered much of the country, and its very existence encouraged young men to build crystal sets (with ear phones) to listen to the new technical marvel. Entrepreneurs set up stations primarily with the goal of selling expensive console radio sets that the whole family could listen to, or which restaurants and shops would buy to attract customers. Madison Avenue early on recognized the importance of radio as a new advertising medium. Advertising provided the major funding for most stations. The United States never had a license fee for set users. The National Broadcasting Company began regular broadcasting in 1926, with telephone links between New York and other Eastern cities. NBC became the dominant radio network, splitting into Red and Blue Networks. The Columbia Broadcasting System (CBS) began in 1927 owned and directed by William S. Paley. 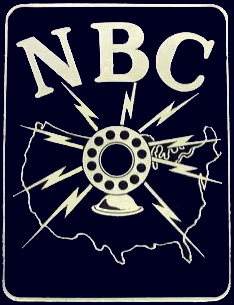 Logo of the NBC Blue Network, pre 1939. Prior to 1927, U.S. radio was supervised by the Department of Commerce. Then, the Radio Act of 1927 created the Federal Radio Commission (FRC); in 1934, this agency was renamed the Federal Communications Commission (FCC) and is still in operation. In the early 1930s, a furious battle broke out as the newspaper industry tried to block the transmission of news by radio. Advertising revenues were plunging during the Great Depression, and newspapers were desperate to protect their main flow of income from the upstart's threat to the status quo. Hollywood and briefly became involved, by preventing its stars from appearing on the radio; it soon realized, however, that radio was not a direct competition in the greater visibility for their stars met even larger audiences. The newspaper attack failed, and the networks set up their own newsgathering and reporting system, which played a major role during World War II. A Federal Communications Commission decision in 1939 required NBC to divest itself of its Blue Network. That decision was sustained by the Supreme Court in a 1943 decision, National Broadcasting Co. v. United States, which established the framework that the "scarcity" of radio-frequency meant that broadcasting was subject to greater regulation than other media. This Blue Network network became the American Broadcasting Company (ABC). Around 1946, ABC, NBC, and CBS began regular television broadcasts. The small DuMont Television Network, was founded earlier; it disbanded in 1956. In 1934, several independent stations formed the Mutual Broadcasting System to exchange syndicated programming, including The Lone Ranger and Amos 'n' Andy. Paley at CBS was the first to fully realize that profitability depended primarily on maximizing the sales of commercials, which in turn meant reaching as large an upscale audience as possible. Surveys and polls could be used to determine not only the size of the audience, but their affluence. Frank Stanton, the president of CBS, worked with Columbia University sociologist Paul Lazarsfeld to develop techniques for measuring audiences. Before Paley, owners typically viewed their stations as stand-alone outlets or as the broadcast equivalent of local newspapers. It was their job to sell ads to local business. Individual stations bought programming from the network and, thus, were considered the network's clients. Paley changed the business model by looking at national advertisers as the critical element. CBS therefore provided network programming to affiliate stations at a nominal cost, thereby ensuring the widest possible distribution for both the programming and the advertising. The advertisers then became the network's primary clients and, because of the wider distribution brought by the growing network, Paley was able to charge more for the ad time. Affiliates were required to carry programming offered by the network for part of the broadcast day, receiving a portion of the network's fees from advertising revenue. At other times in the broadcast day, affiliates were free to offer local programming and sell advertising time locally. By 1940, the greatest audience attention was on the networks' evening programs of variety shows, music, and comedy and drama. In the morning and afternoon, smaller audiences (chiefly housewives) listened to 61 soap operas. Phone-in talk shows were rare, but disk jockeys attracted a following through their chatter between records. The most popular radio shows during the Golden Age of Radio. The Jack Benny Program, Fibber McGee and Molly, The Goldbergs and other top-rated American radio shows were heard by 30–35 percent of the radio audience. 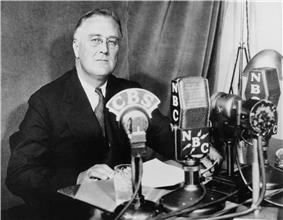 Roosevelt's radio audiences averaged 18 percent during peacetime, and 58 percent during the war. His address of May 27, 1941, was heard by 70 percent of the radio audience. Radio's instant, on-the-spot reports of dramatic events drew large audiences starting in 1938 in the run-up to World War II. Radio in education began as early as April 1922, when Medford Hillside's WGI Radio broadcast the first of an ongoing series of educational lectures from Tufts College professors. These lectures were described by the press as a sort of "wireless college." Soon, other colleges across the U.S. began adding radio broadcasting courses to their curricula; some, like the University of Iowa, even provided what today would be known as distance-learning credits. Curry College in Massachusetts introduced one of the nation's first broadcasting majors in 1932 when the college teamed up with WLOE in Boston to have students broadcast programs. In the 1950s, television courses became popular. After 2000, Internet-based transmission of college courses came on line. 2012 was the "year of the MOOC" (massive open online course). After 1955 television's visual images replaced the audio-only limitation of radio as the predominant entertainment and news vehicle. Radio adapted by replacing entertainment programs with schedules of music interspersed with news and features, a free-form format adopted by NBC when it launched its popular weekend-long Monitor in 1955. During the 1950s automobile manufacturers began offering car radios as standard accessories, and radio received a boost as Americans listened to their car radios as they drove to and from work. Although this period saw the overall decline of the AM radio, some new stations, like the WGIV station in Charlotte dedicated to African American Music, were still coming up. In the 1950s, as a result of television's increased popularity coupled with dramatically loosened restrictions on playing recorded music on air, the network model of radio dramatically declined. In its place was the first music radio format: top 40, the forerunner to modern contemporary hit radio. Top 40 stations could be operated locally and gave rise to the disc jockeys, who became prominent local celebrities in their own right. Top 40 became the outlet for the relatively new style of music known as rock and roll. FM radio, which was the successor to the failed Apex band (also known as ultra-shortwave) experiments of the 1930s, arrived in the United States after 1945, but it was not until the 1960s that it became widely popular. 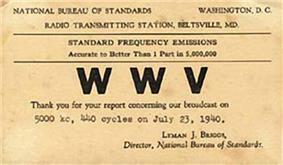 In 1945 the Federal Communication Commission shifted FM's allocation of frequencies from 42-50 MHZ to 88-108 MHZ. This allowed FM much more room for growth when listeners arrived after 1960. The FCC later decided to reduce program duplication on AM and FM sister stations, giving the younger medium space to grow. The better sound fidelity of FM, the less static, dated a natural for musical programming. The first FM stations were primarily instrumental, featuring formats that would come to be known as easy listening and beautiful music, and were targeted at shopping centers. Other, later FM sign-ons became known for experimentation; the early freeform stations eventually evolved into progressive rock, the first radio format designed specifically to showcase rock music. From progressive rock came album-oriented rock, which in turn spawned the modern formats of classic rock, active rock and adult album alternative. Top 40 radio would begin arriving on the FM band in the 1970s as FM reached critical mass. As the amount of archival music from the rock and roll era began to expand, oldies radio stations began to appear, later evolving into the modern classic hits and later adult hits formats. FM radio made a major expansion in the late 1980s with the FCC's Docket 80-90, which expanded the number of available FM licenses in the suburban areas of the United States. Country music in particular, previously only heard on rural AM stations particularly in the Southern and Western United States, benefited from this docket, moving en masse to FM; the beautiful music and easy listening formats mostly died out, with adult contemporary music taking its place. Meanwhile, the AM band began declining. All-news radio became popular in the major cities in the late 1960s. As each successive radio format moved to FM, AM radio stations were left with fewer and fewer options. One of the last "AM only" formats was MOR, or "middle-of-the-road", the direct forerunner of adult contemporary music and adult standards. Talk radio, although it had a small following in the cities, did not achieve mainstream popularity until the 1980s, when a combination of factors led to the rise of conservative talk radio. The politically charged format swept the country, bringing stardom to one of its pioneers, Rush Limbaugh. Also rising to popularity in the late 1980s was sports radio, which was dedicated to talk about sports as well as the broadcasting of sports events. What few country stations remained on AM typically shifted to classic country and focused primarily on older music. While shock jocks had been in existence since at least the 1970s (see, for example, Don Imus) and the morning zoo radio format was popular among local stations beginning in the 1980s, the first shock jock to make a major national impact was Howard Stern, whose New York-based show was syndicated nationwide beginning in the early 1990s. Stern built a multimedia empire that incorporated television, books and feature films, which led to him bestowing upon himself the title of "King of All Media." Stern left terrestrial radio in 2005. Satellite networks began replacing landline-based models in the 1980s, making possible wider and quicker national distribution of both talk and music radio. At the same time, the traditional networks started collapsing: NBC Radio and Mutual both were acquired by syndication company Westwood One, while ABC (both radio and television) was acquired by Capital Cities Communications. CBS would later acquire Westwood One, only to spin it off in 2007. ABC would end up in the hands of The Walt Disney Company, who broke it up in 2007; Disney owns portions of the old network, while the rest of it is in the hands of Cumulus Media. NBC (along with Westwood One) is currently in the hands of Townsquare Media. Mutual was dissolved in 1999, replaced by CNN Radio, which itself was dissolved in 2012. CBS, which still owns much of its network, splits its programming between Cumulus and Townsquare. Only one other major network has appeared since the 1990s: Premiere Networks, the division of Clear Channel Communications. Premiere owns the radio distribution rights to the current "fourth major network", Fox (which owns no radio stations), and distributes that company's news and sports radio broadcasts. Clear Channel benefited from the Telecommunications Act of 1996, which allowed for greater media consolidation, and built a large empire of both large and small market radio stations; Clear Channel, having overextended itself, jettisoned most of its small-market stations (as well as its now-dissolved television division) in the late 2000s. Direct-to-consumer subscription satellite radio began appearing in the United States in the early 2000s, but despite heavy investment in programming has continually lost money and has less than a tenth of the reach of terrestrial radio. The two competing satellite radio services, Sirius and XM, merged to form Sirius XM Radio in 2009 and now has a government-regulated monopoly on the format. While broadcast radio stations will often brand themselves with plain-text names, identities such as "cool FM", "rock 105" or "the ABC network" are not unique. Another station, in another city or country, may (and often will) have a similar brand; the name of a broadcast station for legal purposes is, therefore, normally its ITU call sign. Broadcast stations in North America generally use call letters in the international series, with common conventions followed in each country. In the United States, the first letter generally is K for stations west of the Mississippi River and W for those east of the Mississippi; all new call signs have had four characters since 1930, although there are historical three-character calls still in use (such as WOR in New York City, WBZ in Boston, WOL in Washington DC, WSB in Atlanta, WGN in Chicago, KOA in Denver, KSL in Salt Lake City, KEX in Portland, Oregon, and KFI in Los Angeles). The expansion and dominance of FM radio, which has better audio quality but a more-limited broadcast range than AM, represented the major technical change in radio during the 1970s and 1980s. FM radio (aided by the development of smaller portable radios and "Walkman" headsets) dominates music programming, while AM has largely shifted to talk and news formats. Talk radio became more popular during the 1980s as a result of improved satellite communications, the repeal of the Fairness Doctrine and (by the mid-1990s) extensive concentration of media ownership stemming from the Telecommunications Act of 1996. While before the 1980s talk radio was primarily a local phenomenon, the development of national spoken-word programming contributed to the renewed popularity of AM radio. However, this popularity is fading as previously AM-only stations begin moving their operations to FM simulcasts or translators, and as the audience of talk radio ages. Both FM and AM radio have become increasingly specialized. Music formats (for instance) comprise a variety of specializations, the top five in 1991 being "country and western", "adult contemporary", "Top 40", "religion" and "oldies". Radio has been shaped by demographics, although to a lesser degree than television; modern radio formats target groups of people by age, gender, urban (or rural) setting and race. As such, freeform stations with broad-spanning playlists have become uncommon on commercial radio. In an era in which TV is the predominant medium, the reach of radio is still extensive. Ninety-nine percent of American households in 1999 had at least one radio; the average is five per household. Every day, radio reaches 80 percent of the U.S. population. Revenue more than doubled in a decade, from $8.4 billion in 1990 to more than $17 billion in 2000. Radio continues to prevail in automobiles and offices, where attention can be kept on the road (or the task at hand) while radio is an audio background. The popularity of car radios has led to drive time being the most listened-to dayparts on most radio stations, followed by midday (or the "at work" shift). Transistor radios, a technology that has been available since the 1950s, were the method of choice for listening to music on the go for most of the late 20th century, before digital media players and later smartphones (many of which have FM radios as part of their hardware) took those roles in the 20th century. The majority of programming in the United States is in English, with Spanish the second-most popular broadcast language; these are the only two languages with domestically produced, national radio networks. In the largest urban areas of the United States, "world ethnic" stations may be found with a wide variety of languages (including Russian, Chinese, Korean and the languages of India); relatively widespread languages French and German have comparatively few radio outlets (in the case of German, due to the fact that most of its speakers are Amish or from similar sects and thus shun radio technology). French speakers can generally receive programming direct from Canadian broadcasters, which are receivable near the Canadian border, and a handful of local stations serving the Haitian diaspora and Creole populations also serve areas in the southeast. Until the 1980s, most commercial radio stations were affiliated with large networks such as ABC, CBS, the Mutual Broadcasting System, NBC, and others (e.g., RKO in the 1980s). The traditional major networks that had dominated the history of American radio up to that point began to be dissolved in the 1980s; RKO was forced to break up in a billing scandal, while NBC Radio and Mutual sold their assets to up-and-coming syndicator Westwood One, which itself would be bought by rival CBS in the 1990s. ABC maintained most of its radio network until 2007, when it sold off most of its stations to Citadel Broadcasting and later Cumulus Media (it maintains two specialty networks, sports-oriented ESPN Radio and youth top 40 Radio Disney, the latter of which has largely shifted to Internet radio; ABC still produces radio programming in addition to its terrestrial networks). CBS sold off Westwood One to private equity interests in the late 2000s as well, but unlike its rivals maintained ownership of its flagship stations. As of 2012, most commercial radio stations are controlled by media conglomerates and private equity firms such as Bain Capital (Clear Channel Communications), Oaktree Capital Management (Townsquare Media) and Cumulus Media. Unlike most countries, the national and state governments in the U.S. do not operate any stations or networks. It does operate networks overseas through the Broadcasting Board of Governors. The most widely known is Voice of America. These are all expressly forbidden from being marketed to American citizens until 2013 and still neither owns nor affiliates with any AM or FM station. In lieu of a national broadcaster, the United States government instead subsidizes nonprofit radio programming through the Corporation for Public Broadcasting. The BBC World Service has been distributed in the United States since 1986; until July 2012 by PRI, and since then by APM. A new form of radio which is gaining popularity is satellite radio. Sirius XM Radio has a monopoly on the technology after the merger of Sirius Satellite Radio and XM Satellite Radio. Unlike terrestrial-radio broadcasting, most channels feature few (or no) commercials. Satellite-radio content is not regulated by the Federal Communications Commission (FCC). Cable radio, a slightly older technology, has also become widespread; Music Choice is the market leader in this field, with its primary competitors being Sirius XM, Muzak, DMX, Sonic Tap and Canada-based Galaxie. CRN Digital Talk Radio Networks specialize in talk radio. Cable radio has the disadvantage that it requires a cable TV hookup, limiting its use outside the home. Unlike the mandated digital television transition, the U.S. government has not mandated a transition to digital radio, although it allows digital radio to be broadcast. The national standard is HD Radio, a proprietary in-band on-channel format that allows digital and analog signals to be broadcast simultaneously. Radio companies aggressively marketed HD Radio throughout the 2000s, touting its clearer signal and capacity for digital subchannels, but the technology never caught on with the general public. The negatives were cost, signal reception problems, a general lack of quality programming on the subchannels, and (especially on AM HD stations) adjacent-channel interference. HD Radio's primary use has been to exploit an FCC loophole to allow low-power broadcast translators to carry HD subchannels in analog, thus giving radio station groups the ability to program more program services in a market than the federally mandated maximum number of stations allowed. FMeXtra is another subchannel service authorized for use in the United States, although that service is generally limited to voice transmissions due to lower bandwidth. Internet radio, digital music players and streaming-capable smartphones are a challenge to terrestrial radio. Unlike satellite radio, most Internet stations do not require a subscription; several of the more popular ones use algorithms which allow listeners to customize the music they want to hear and select new music which may interest them. The proliferation of internet-based stations (which are more numerous and easier to set up than their television counterparts) creates a threat of audience fracturing beyond that experienced by television due to cable and satellite providers; the recording industry also sees Internet radio as a threat and has attempted to impose high royalty rates for the use of recorded music to discourage independent stations from playing popular songs. Although not nearly to the extent that AM radio has declined in neighboring Canada, AM radio has also begun to decline in the United States. To partially combat this, radio ownership groups have increasingly moved their signals to FM, either through low-power broadcast translators (primarily on small, independent and/or rural stations) or through simulcast on full-market FM stations. The AM-to-FM phenomenon began primarily in mid-sized markets, where there is more bandwidth and less competition, but has since progressed even to New York City, where as of 2012 sports-talk AM stations WEPN and WFAN have both acquired FM stations with the intent to either move or simulcast their AM programming. By 2013 most of the AM/FM simulcasts had been discontinued, in part due to redundancy and the fact that most listeners to AM stations stayed with AM while very few new listeners were picked up on the FM side. Abridged from U.S. State Department IIP publications and other U.S. government materials. ^ Thomas H. White, "United States Early Radio History", p. 4. Archived from the original 2012-04-16. ^ Jim Cox, American Radio Networks: A History (2009). ^ Michael B. Schiffer (1991). The Portable Radio in American Life. University of Arizona Press. p. 46. ^ William B. Ray, FCC: The ups and downs of radio-TV regulation (1990). ^ Mark R. Levy, "The Lazarsfeld‐Stanton Program Analyzer: An Historical Note." Journal of Communication (1982) 32#4 pp: 30-38. ^ Billboard. 21 April 1945. p. 6. ^ Alice Goldfarb Marquis, "Radio grows up," American Heritage (Aug/Sep1983) 34#5 pp 64-80. ^ Douglas B. Craig (2005). Fireside Politics: Radio and Political Culture in the United States, 1920-1940. Johns Hopkins University Press. p. 156. ^ Erik Barnouw (1968). A History of Broadcasting in the United States : Volume 2: The Golden Web. 1933 to 1953. Oxford UP. p. 6. ^ Gerd Horten (2002). Radio Goes to War: The Cultural Politics of Propaganda During World War II. University of California Press. ^ "Tufts College to Give Radio Lecture Course." Olympia (WA) Daily Recorder, March 25, 1922, p. 5. ^ "U of I Offers Full Credits in Air School." Rockford (IL) Daily Register, October 5, 1925, p. 4. ^ Robert J. Blakely, To serve the public interest: Educational broadcasting in the United States (Syracuse Univ Press, 1979). ^ Frank Hoffmann and Jack M. Dempsey, and Martin J. Manning, Sports-Talk radio in America: Its context and culture (Routledge, 2012). ^ White, Thomas H. (2012-01-01). "Mystique of the Three-Letter Callsigns". Retrieved 2012-01-10. ^ Thomas H. White. "Mystique of the Three-Letter Callsigns". Retrieved 2011-07-15. ^ George H. Gibson Public Broadcasting; The Role of the Federal Government, 1919-1976 (Praeger Publishers, 1977). ^ Chad Navis and Mary Ann Glynn, "How new market categories emerge: Temporal dynamics of legitimacy, identity, and entrepreneurship in satellite radio, 1990–2005." Administrative Science Quarterly (2010) 55#3 pp: 439-471. ^ John Nathan Anderson, "Radio broadcasting's digital dilemma." Convergence: The International Journal of Research into New Media Technologies (2012): 1354856512451015. Dimmick, John, and Daniel G. McDonald. "Network radio oligopoly, 1926-1956: Rivalrous imitation and program diversity." Journal of Media Economics (2001) 14#4 pp: 197-212. Lazarsfeld Paul F. The People Look at Radio (1946).